It is noticed in recent years that in banking examinations, terms with special reference to Banking are frequently asked. These terms are useful not only for written examination of banking but also for interview and aspirant’s overall general knowledge. 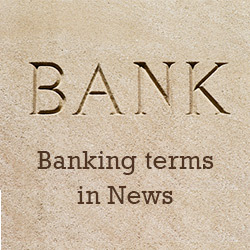 These terms will also help candidates to understand banking news and articles in more lucid manner. So, the banking team of Jagran josh has come up with some important banking terms. Net Interest Margin (NIM) is an indicator of bank’s performance; it is the difference between the income earned on lending and interest spent on deposit. Better performing banks have net interest margin in the range of 4% and above while average banks have NIM of 2 or 2.5%. There is no such thing asturnover or sales for banks. Non-interest Income is the bank’s income mainly from service such as processing fees or penalty charges. Also it includes sale of assets sales, commission earned on sale of third party products like insurance, pension schemes, and mutual funds. Income earned on treasury operations is significant portion on non-interest income. Non-performing assets (NPA) are loans where borrower payments have remained overdue for a period for over 90 days. Banks are required to classify NPAs further into substandard — when the loan is over due for 90 days; doubtful asset — when the loan is over due for 12 months; andloss asset — loans that are considered uncollectible. CASA is basically the Current Account and Savings Account deposits. CASA ratio is the share of current and savings account deposits to the total deposits of the bank. The interest rates paid on CASA deposits is administered by banking regulator, the Reserve Bank of India (RBI). Banks do not pay any interest on current account and as low as 4% on savings account. The higher share of CASA to total deposits the better it is since it brings down the cost of deposits and paves way for better margins. CAR is a cushion that banks have to maintain in form of its owned funds to off-set any loss that the banks makes if an account holders fails to repay dues. The CAR is decided by central banks to prevent banks from becoming insolvent in the process and taking excess leverage. It is also knownas Capital to risk (Weighted) asset ratio (CRAR). It is slice of income that banks have to set aside to cover potential losses on loans. The longer the overdues, the higher is the provisions that banks have to make on loans. However, if the borrower provides security against the loan, provisions are lowered.